Discovery proteomics in septic DIC implicate endothelium and Angpt-2. (A) Heatmap representation of SOMAScan plasma analytes in severe sepsis with DIC (n = 7) and sepsis (n = 7). Color scale indicates relative expression. (B) Volcano plot showing analytes that were increased or decreased in sepsis DIC compared with sepsis without DIC (non-DIC) with P values less than 0.05 indicated in red. 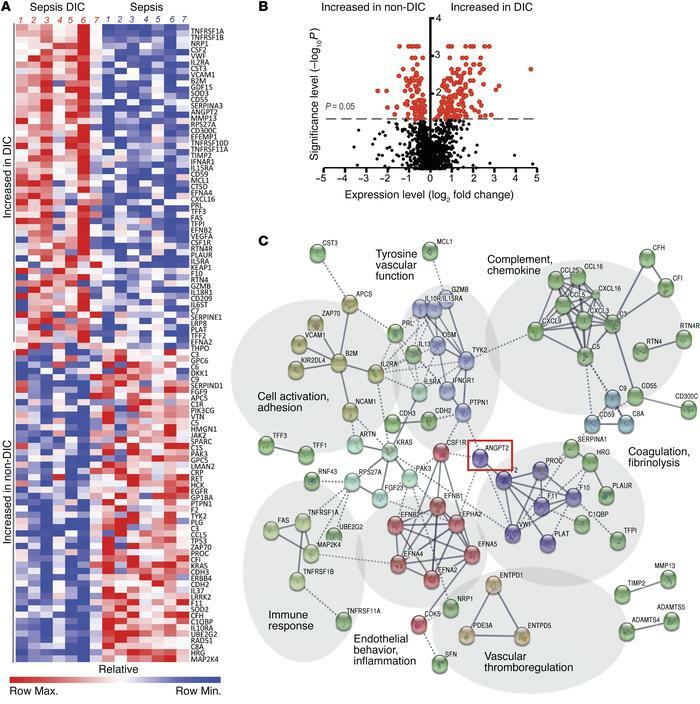 (C) STRING analysis and visualization of high-confidence interaction clusters (k-means = 9 clusters indicated by node color) formed by plasma proteins and labeled on related functional categories. Solid line represents within-cluster, dashed gray line represents between-cluster interactions.